When Matt Anderson broke his back and became paralysed from the waist down nearly 30 years ago, he never could have foreseen the career he would go on to have. Only 19 at the time, Matt was living in Canada, thousands of miles from his family, when the unthinkable happened. He lost control of a truck, came off the road and went flying through the windscreen. He lay in a field for around seven hours before he was found and was placed in a coma for three weeks. In Matt’s words, he was lucky to be alive. Fast forward to today, and it’s safe to say he’s made the very most of the opportunities he’s been afforded. Matt would almost certainly have died had he been wearing a seatbelt, such was the level of damage to his truck. He spent six weeks at hospital in Canada before being flown back to the UK in time for Christmas. Eight months of rehab and spinal surgery at Salisbury Hospital followed, before Matt was eventually discharged. As a result of his accident, Matt is paraplegic, paralysed from just below the waist and is a permanent wheelchair user. It would be fair to assume that most people in this situation wouldn’t consider embarking on a career as a personal trainer. Throughout his life, Matt had been fit and active, which is why a friend suggested that he should start using the gym. Matt was understandably cynical at first – but he needn’t have been, because a few gym sessions became something much bigger. He said: “I had always been fit and played football regularly, but I was a little unsure as to how I would get on in a gym considering my newfound situation. Matt began working part-time at a local fitness club, while studying to be a fitness instructor with the now-defunct Aerobics and Fitness Organisation of Great Britain. Soon after he qualified, the people who owned the club went bankrupt which, although unfortunate, gave Matt his big break. Matt and two colleagues set about finding a new location and investing in the set-up of a new club. They opened a boutique gym together in Poole – and so began Matt’s journey. 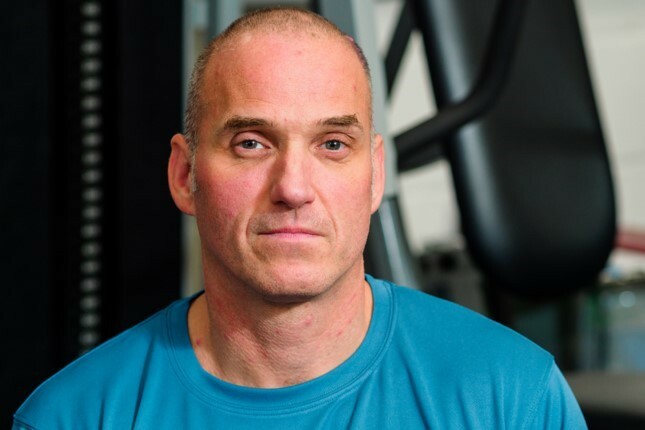 Matt ran Images Health & Fitness in Poole for 19 years. During this time, he qualified as a personal trainer and bought out his other two business partners, leaving him as a sole trader. This allowed Matt to put his own unique stamp on personal training, by showing his clients that anything was possible. He said: “I am most proud of being able to motivate and inspire people to get fit. After all, I am not your typical personal trainer who, to many, can be off-putting and representative of a level of fitness that the average person is unlikely to achieve. “Most of my clients were not looking to get on stage or lift constant personal bests, but instead to improve their fitness levels without being judged, in the company of others with a similar mindset. Unfortunately, Images had to close after the building’s landlord sold the freehold and the new owners decided more money could be made by converting the premises into flats and offices. This marked a sad end to Matt’s two decades at the gym – but after everything he’d overcome to become a personal trainer in the first place, he was never going to let this setback get the better of him. Matt moved to a small private studio and set up his own one-to-one personal training business, which he still runs today. He provides a broad variety of personal training and nutritional support services, including circuit training, weight loss classes and MedX workouts. The big selling point of Matt’s service is that he helps the client work at their own level, without fear of being judged or intimidated. This inevitably has meant that people from all corners of society have reached out to Matt to help them achieve their goals. Among Matt’s proudest achievements is helping an 80-year-old stroke victim stay active and improving his quality of life and training a ‘relatively unfit’ 20-year-old woman who went on to join the army. In fact, this woman invited Matt to her passing out ceremony, which illustrates the high regard in which he’s held by his clients. To Matt, these people aren’t just customers – they’re much more than that. He said: “To see people grow in confidence as their weight decreases or their muscles grow is a great feeling that I will never grow tired of. “A lot of people enter the profession thinking they will be training supermodels, but there is a far greater sense of satisfaction to be had from helping ordinary people feel better about themselves. Whilst we received a whole host of amazing entries, many of which were worthy of winning the award, Matt’s stood out because of his incredible and unlikely journey. As a result of winning our award, Matt has received a year’s free insurance and a badge which he can display on his website to show potential customers – but to be appreciated for his work is reward enough. He said: “When I first read the email stating that I had won the award, I was quite taken aback. I certainly wasn’t expecting to be chosen above many of the other personal trainers out there making a difference on a daily basis. “To say I was chuffed would be an understatement and I feel quite proud to have been recognised for what I do. I don’t do what I do for praise or recognition, but it is always nice to be appreciated for my work. Matt’s story proves that the personal industry is not ‘one size fits all’, and that if you have a passion which you’re prepared to work hard for, you can turn it into a long, successful career. He said: “I enjoy sharing my knowledge with others and love the fact that I am a disabled trainer in an industry packed with the super fit, more conventional personal trainers. Another key piece of advice which Matt would give to other personal trainers is – make sure you have specialist personal trainer insurance. Without it, your career could be over before it’s got off the ground. He said: “Insurance is an unglamorous but essential part of personal training, and one which should not be overlooked. “The nature of the industry we are in means that we must be properly insured, and by using a specialist company we can be sure that this is the case. We couldn’t have put it better ourselves. If you’re inspired by Matt’s story and want to follow in his footsteps, you can enter our Personal Best Award. We’ll be announcing our next winner in June. Best of luck!